Ok Readers, today I am asking some questions. If you have struggled with weight or just changing your lifestyle to healthier eating and exercise, tell me about the moment it just became your way of life. What clicked for you? Here is why I am asking. This week I am not weighing in. I am not because I know I will be disappointed and I don't want to do that to myself. 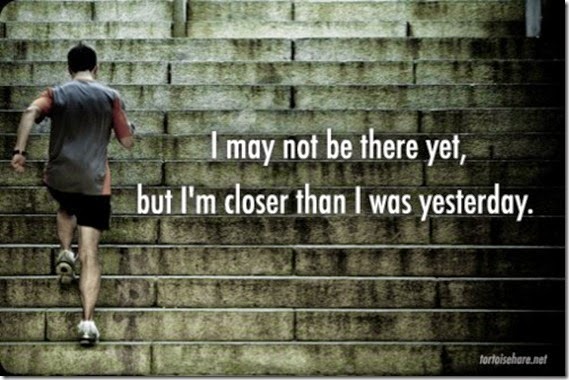 Last week, I felt that I did really good and lost 0.2 pounds (click here to read Week #1). This week, I did terrible so I can only imagine what the scale will show. Honestly, I just don't want to disappoint myself, I don't want to get down on myself because I feel like it will make my motivation worse. I don't understand this week because last week I felt so motivated. I looked at the calendar and decided what time each day I would be able to squeeze in my workout. I had things planned for dinners, breakfasts and lunches. I followed the plan besides my nights out. I felt good. Although it didn't show on the scale. This week, Monday was Olivia's birthday, Tuesday her birthday party, Wednesday we went to a birthday party and it was Owen's birthday. So you can already see one thing that happened this week. I ate cake. Every. Day. I also was busy and my mother guilt kicked in. I was trying to prepare for the party Tuesday and then decided rather than getting my workout in, I would take the kids for a swim before the party. Wednesday, I woke up exhausted. I felt like I had no energy to get a workout in before we left for the day and then of course it never happened between being gone most of the afternoon and then celebrating Owen's birthday. So now, I am beating myself up. I want to know what is wrong with me? If I want to lose weight so bad, why can't I keep my motivation?? One bad choice in eating leads to more. Why? I know that I love getting up before the kids to have some quiet time, then I can work out earlier. I do it for a week and then "I am too tired to get up." I know I love how I feel when I work out. I do it consistently for a bit and then I start coming up with excuses. I know I feel great when I eat great, when I am organized and prepared with food. I do it for a few weeks or less and then I don't have time. Do you see a trend here? I was feeling so positive and motivated and I know I will come back from vacation feeling like that again. But, what is going to happen over vacation? 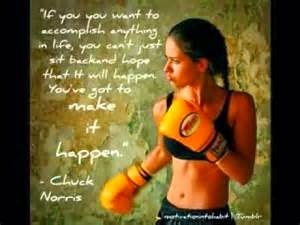 I am debating taking my T25 with me. Will I do it? I'm on vacation. I know I won't eat great, I will try not to eat terrible, but I'm on vacation. I will drink because I am on vacation. So not only did I not lose weight before my vacation, am I going to come back 5 pounds heavier?? I know I have tried to stay positive and this post is anything but positive. But I promised to "Keep it Real" and this is Real right now. I had a long conversation with a friend of mine a few days ago and she is feeling the same way, so I know some of you are also feeling these things. So I hope that I am showing you that you are not alone. 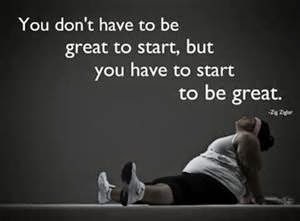 But, for people on the other side of this feeling, for the people that exercise everyday and don't feel right if they don't, for the people that eat healthy as just a way a life and not a constant struggle, tell us your secret. If you struggled with your weight. What was your "click" moment when it became your way of life and not a struggle anymore? How do you get your workout in everyday? When do you do it? Same time every day or whenever it works? If you made yourself from a night person to a morning person, how did you do it? How do you handle food? Do you diet? Is healthy eating second nature now? When my friend and I talked the other day, we talked about the "click moment" the moment when all of a sudden someone just says I am doing it and goes and doesn't stop and everything I long for, falls into place for them. Talk to me about that moment. I need to figure out when to workout and I need to stick to it no matter what. How do I do that? How do I stay consistent even when I feel tired? I badly want to become a morning person. I could stay up until midnight every night no problem, but that time isn't being used as a workout time or meal prep time. That time is used blogging or watching TV. By the end of the day I am not necessarily falling asleep, but my body is tired and ready to rest. I want to wake up before the kids, blog and have some quiet time to myself. I want to workout early and get it done. I know I can't do it right out of bed, because I need to wake up, but if I got up and had an hour or two to myself to do some quiet things, workout, shower and then start my day...this would be my perfect world. I want it so bad. How do I do it?? Mike and I talk about food. All. The. Time. He wants to diet. He thinks that if we diet and see some progress we will feel more motivated. I agree that with some progress on the scale I will probably stay motivated longer than a minute, but I want a lifestyle change. I feel like if I do a diet that as soon as I come off the diet I will go back to my old ways and put the weight back on. Sound familiar to anyone? Certainly does to me! So, advice is welcome. Do we diet and make some progress? Is trying clean eating not working for us? He wants to do weight watchers. I would love some advice! I am going on vacation starting today. Please share my post this week. I want to hear what everyone has to say. I know there are others feeling just like me that also want to hear. There are people out there that have gotten through this struggle and have reached their goals and I want to hear what you have to say. 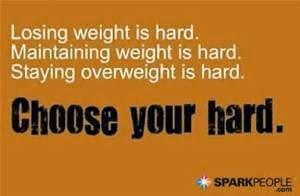 There are people out there that have never struggled with weight, but there is a reason for that...what works for you?? People have told me they can't comment on the blog. If you have trouble posting a comment on here, read my "Thank you" post here. It gives some instructions on commenting. Please Share and Comment! Since I am being a little negative with my feelings today. 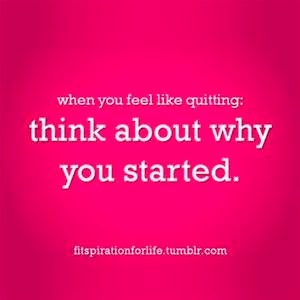 I will leave you with some motivational quotes! • If you struggled with your weight. What was your "click" moment when it became your way of life and not a struggle anymore? Around the holidays this year, I was approaching 200 lbs. on the scale (198). I hadn't been that heavy in years and was starting to notice it enough in the mirror to make me really angry. For me, that qualified as a "click" moment because I did not want to get over 200 lbs. at 36 years old. It only gets harder to lose weight the older we get. • How do you get your workout in everyday? When do you do it? Same time every day or whenever it works? Luckily for me, my work office has 2 showers on site and the boss encourages exercise for all employees so I do my 3, 4 or 5 mile runs during my lunch break 3 days/week Monday-Friday. Lately, since Monica and I have been half-marathon training, Saturday mornings have been my 4th workout time while doing our longer 8-12 mile runs. Working as a team with your husband/wife is vital. Monica has been going out for long runs at 6am, I head out when she gets back. P90X3 is also in the mix on days I don't run since the Tough Mudder in Westbrook is coming up in August. • If you made yourself from a night person to a morning person, how did you do it? I am, and will always be, a night person. My workouts have to happen in the afternoon/evening or they won't get done. My body is not ready for 6am workouts, unlike Monica. Everyone is different in this regard, some can exercise early in the day, I know it just doesn't work for me. • How do you handle food? Do you diet? Is healthy eating second nature now? I wouldn't say my meal choices are great, but they're a lot better than they used to be. The most important thing is PORTION CONTROL. My breakfast is usually a single english muffin or bagel. I used to bring a bag of chips to work on Monday to have with my lunch sandwiches and it would be empty after Wednesday afternoon. I started buying the little chip bags (120-140 calories each) and now eat 1 of those each day instead. Instead of sugary junk for a late afternoon snack I now eat an apple or banana each day. Dinners are usually chicken, pasta, tacos, tuna, pizza, etc. (not all at once). LOTS of water each day (100 oz.) and skim milk along with a diet soda for my caffeine pick me up. I don't really "diet" since my belief is that as long as you're doing your workouts (good ones, really sweating and burning measurable calories) you can eat pretty much what you want while watching the portions. Since December, I have lost 14 pounds and kept it off, currently at 184 lbs. I look better, feel great and look forward to getting under 180 in the near future. 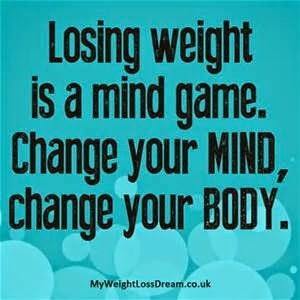 Losing weight is ALL MENTAL. 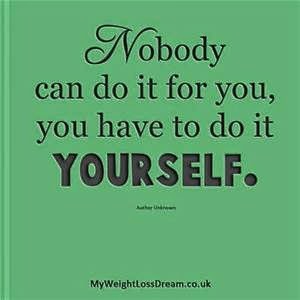 You have to use will power 24/7 to think about what you're putting in your body. Sign up for some races to get your mind focused and put pressure on yourself. This Sunday will be the tenth half marathon I've run over the past 8 years. 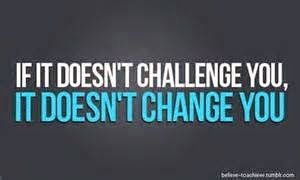 You have to keep yourself challenged or it becomes too easy to push back exercising a day, a week, a month, etc. And yes, throwing kids/family into the mix with all of this is tough...but using them as an excuse not to stay healthy is just weak. Of course you should bring your T25 with you on vacation. We're on vacation next week as well but you can sure as hell bet I'll be running at least 3-4 5k's while at camp. So that's my rah-rah speech, if you want more advice or need someone to yell at you on a regular basis let me know, all the best to you and Mike and the kiddos! Thank you Elizabeth! 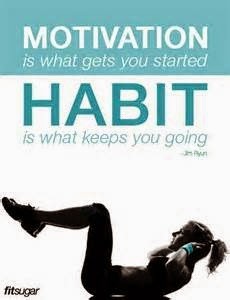 I love that you think of your workouts as a hobby, what a great outlook! What do you do for workouts? You are so right! 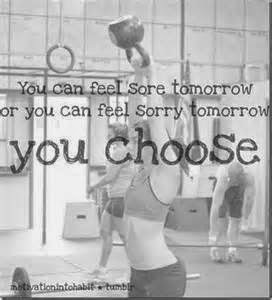 It is a CHOICE...love that! !